The data, from Public Health England (PHE), compared levels of deprivation with numbers of takeaways such as chip shops, burger bars and pizza places. 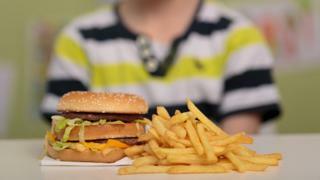 Experts say children exposed to fast food on the way home from school are more likely to eat unhealthily. PHE wants local authorities to refuse applications from new takeaways. One in three children is now overweight or obese by the age of 11. And children from poorer areas are more than twice as likely to be overweight. Adults are also affected, with research in Cambridge indicating people living closest to the largest number of fast food outlets were more than twice as likely to be obese. PHE is also encouraging local authorities to work with existing small businesses to provide healthier options. The research analysed data from the Food Standards Agency, which inspects all food businesses. It indicated 17% of fast food outlets were located in the most deprived areas, compared with just 3% in the least deprived. PHE chief nutritionist Dr Alison Tedstone said: "Local authorities have the power to help support people in making healthier choices. "They need to question whether these fast food hotspots are compatible with their work to help families and young children live healthier lives." Prof Russell Viner, of the Royal College of Paediatrics and Child Health, said: "Kids are coming out of school hungry and finding themselves surrounded by cheap chicken shops, chip shops and other types of tempting junk food. "This food is tasty and cheap - it's easy to blame the individual, but humans, particularly children, will find it hard to resist tempting food. "Children from wealthy backgrounds will not be surrounded by junk food in this way." The report comes a week after the government published its updated Childhood Obesity Plan, which aims to halve childhood obesity in England by 2030. As well as restrictions on junk food ads and supermarket checkout sweets, Health Secretary Jeremy Hunt MP pledged to "help close the deprivation gap." Some local authorities are already developing "healthy zones" by limiting the number of fast food outlets. In Gateshead, where 23% of 10- and 11-year-olds are obese, new planning rules were put in place in 2015. Since then, no new planning applications for fast food takeaways have been approved. Other councils are working to improve the offering at existing takeouts. In Tottenham, Taster's Fried Chicken recently started a new healthier menu for children. The menu included grilled chicken, salad and chunky chips (lower in fat than French fries) in controlled portion sizes, at the same price as regular fried chicken. Another scheme has been trialled by the Alexandra Rose Charity, which offers vouchers to low-income families to help them buy fresh fruit and vegetables. Since the scheme began, 2014, about 750 families have taken part, in London and Liverpool. And of those families, 95% ate more fruit and vegetables and reported improved health and wellbeing. But Izzi Seccombe, from the Local Government Association, said more needed to be done. "Numerous councils have set curbs on new fast food outlets - but current legislation means they lack planning powers to tackle the clustering of existing takeaways already open. "New legislation is needed to empower councils to help drive forward an effective redesign of damaging food environments."